Lease To Purchase Amarillo: What Does Lease With Purchase Mean? Our Home Finance Pros Explain! These days, potential homebuyers have a range of tools and tactics at their disposal to secure a new place to live. First-time buyers, homeowners looking for a second home, and other parties can all benefit from advantageous mortgage loans and trusting support provided by their home finance team. One sure way to move into the home of your dreams is to build a new house to suit your exact needs. For years, B&M Asset Group has worked with our partner company IPS Amarillo to provide the best terms for buyers of all backgrounds. By focusing on purchasing large spans of land at a time, our home builders are able to create high-quality outcomes that are as cost-effective as they are beautiful! Our focus centers around neighbors and creating a wonderful community for residents across Texas. 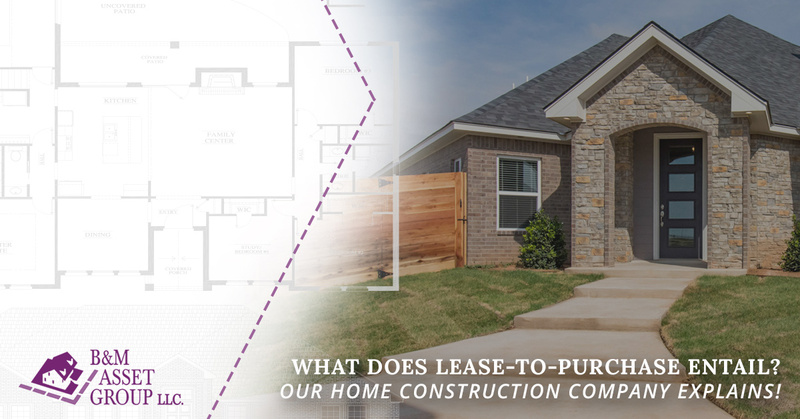 Today, we’ll discuss the benefits of our lease-to-purchase program for Amarillo properties, as well as versatility offered by our building contractors. Contact us today to learn more about our unique approach, and be sure to contact us today to begin your home buying process! Sometimes referred to as a lease-to-own purchase, this method of home financing can prove to be beneficial for everyone involved. B&M Asset Group has experience in building and leasing to meet the needs of homeowners of all types. Our approach provides flexibility for buyers who do not wish to see their monthly payments be wasted on rent and also are not ready to make the commitment to a traditional purchase. Whether you are facing credit issues or legal problems, a lease-to-purchase option may be the most advantageous choice for finding the perfect property. Lease with purchase options are also beneficial for residents who are unsure as to how long they will be staying in the Amarillo area. Those staying for at least 12 months can benefit from our cost-effective lease with purchase program, allowing clients to apply their payments toward the purchase of the home if they decide to stay. Our team will be able to offer flexible rates that keep up with modern market prices to ensure you lock in a competitive lease. B&M Asset Group can assist applicants with low or bad credit, reporting your payments to the Experian Rent Bureau to improve credit scores. Best of all, leasees who opt to pay their option fee up front can reduce their monthly price and have an amount credited toward their purchase of $350. For every $1,200 dollars put down, our lease with purchase program will drop the payment by $100 and add that amount toward the credit. If you decide not to pay any option fee, no problem! We’ll still give you the $350 per month credit. Our home finance pros have the experience needed to deliver the best results for your unique situation, and we will work hard to overcome any obstacles to place you in a beautiful new home constructed by our masterful home builders. B&M Asset Group is here to help buyers of all types to lease with a purchase option, providing considerable benefits over renting. Our team is here and ready to help, so be sure to contact us today to learn how you can lease to purchase the home of your dreams in Amarillo!